Fulfill a contract for the Companions to retrieve a stolen family heirloom. 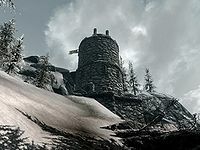 Speak to Skjor or Vilkas at Jorrvaskr. Retrieve the heirloom from the location's boss chest. Return the heirloom to Skjor or Vilkas for your reward. "I tell you this province is losing its grip. The bandits become more brazen every day." "Some don't even believe they exist, but the Falmer can be devious. Tunneling into homes, stealing off with valuables." "Those hill people who call themselves 'the Forsworn' show no mercy." "Giants don't usually cause problems like this, but these ones are stirred up for some reason.."
"The rumors say the culprits are vampires. I try not to listen to swaggle like that, but figured you should know." "Of course, it's a group of wizards they're pointing their fingers at. Who knows what they want it for, but we want it back." The stolen item is randomly determined, from a list that includes all standard unenchanted weapons in the game. You are never told the name of the family who lost the item, only the hold in which they live. (Note that the provided categories list all locations with the given type of occupant, including locations that do not have a boss chest and therefore cannot be possible destinations for this quest). At the chosen location, the item will always be found in the boss chest, which is typically at the end of the dungeon and guarded by a boss-level monster. To complete the quest, all that you need to do is retrieve the item — although in the process of exploring the dungeon you may end up collecting other loot and killing various enemies. Once you have the heirloom, return to the quest-giver (Skjor or Vilkas) and obtain your reward and three different responses: "Give it here. They've asked for the utmost discretion on this matter, so I'll make sure it gets to them. Here's your share of their reward. ", "And it looks undamaged. They'll be pleased, I'm sure. And we're pleased with their money." or "Nice work with this one. You make us all proud." The quest-giver for this quest is originally Skjor. However, once Skjor has been slain during The Silver Hand, Vilkas instead becomes the quest giver for this quest. The item you are sent to retrieve may not spawn at the location indicated by your quest map marker. The quest may get broken, showing in the questlog like "Retrieve [...] from [...]", and with the quest map marker indicating one of the hidden NPC chests beneath the surface of the game. ? On the PC, it is possible to use the console to advance through the quest by entering setstage CR06 stage, where stage is the number of the stage you wish to complete. It is not possible to un-complete (i.e. go back) quest stages, but it is possible to clear all stages of the quest using resetquest CR06. This page was last modified on 25 January 2017, at 21:34.